// Java applet to draw "Hello World"
What may the problem be? These are the assigned major numbers. The error regarding the unsupported major.minor version is because during compile time you are using a higher JDK and a lower JDK during runtime. Thus, the 'major.minor version 52.0' error is possibly because the jar was compiled in JDK 1.8, but you are trying to run it using a JDK 1.7 environment. The reported number is the required number, not the number you are using. To solve this, it's always better to have the JDK and JRE pointed to the same version. Go to Maven Settings → Maven → Importing. Set the JDK for importer to 1.8. Go to Maven Settings → Maven → Runner. Set the JRE to 1.8. Go to menu File* → Project Structure → SDKs. Make sure the JDK home path is set to 1.8. Another approach which might help is by instructing IntelliJ IDEA which JDK version to start up with. The smart way to fix that problem is to compile using the latest SDK and use the cross compilation options when compiling. To use the options completely correctly requires the rt.jar of a JRE (not JDK) of the target version. Given the nature of that applet, it looks like it could be compiled for use with Java 1.1. You will need to change your compiler compliance level back to 1.7 in your IDE. This can be done in the preferences settings of your IDE. For example, in Eclipse go to menu Windows → Preferences, select Java, and expand it. Then select Compiler and change the compliance level to 1.7. I am sure this will work from there. You must run and compile your application with the same version of Java. 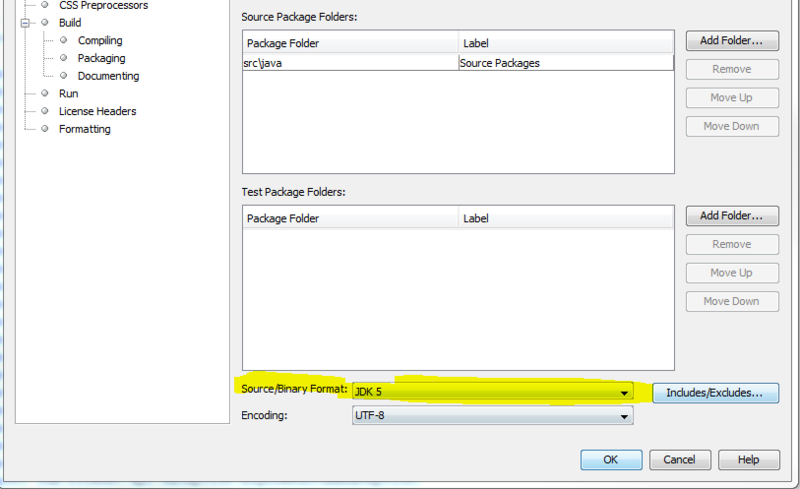 In Eclipse, click on "Window > Preferences", and in the window that appears, on the left side, under "Java", click on "Installed JREs", click on "Add..." and navigate to the folder that contains the JDK. Right-click on your project and click on "Properties", in the window that appears, on the left side, click on "Java Compiler" and uncheck "Use compliance from execution environment on the Java Build Path", this allows you to choose in the the list "Compiler compilance level" the same version that you set in the previous step. You need to upgrade your Java version to Java 8. Download latest Java SE Development Kit 8 release from its official download page or use following commands to download from the shell. # wget --no-cookies --no-check-certificate --header "Cookie: gpw_e24=http%3A%2F%2Fwww.oracle.com%2F; oraclelicense=accept-securebackup-cookie" "http://download.oracle.com/otn-pub/java/jdk/8u51-b16/jdk-8u51-linux-x64.tar.gz"
# wget --no-cookies --no-check-certificate --header "Cookie: gpw_e24=http%3A%2F%2Fwww.oracle.com%2F; oraclelicense=accept-securebackup-cookie" "http://download.oracle.com/otn-pub/java/jdk/8u51-b16/jdk-8u51-linux-i586.tar.gz"
Note: If the above wget command doesn’t not work for you, watch this example video to download the Java source archive using the terminal. After extracting the archive file, use the alternatives command to install it. The alternatives command is available in the chkconfig package. Check the installed version of Java using the following command. Note that the change to the PATH variable put the new Java bin folders first so that they override any existing java/bins in the path. It is a bit sloppy to leave two java/bin folders in your path so you should be advised to clean those up as a separate task. Also, put all above environment variables in the /etc/environment file for auto loading on system boot. I had the same problem... a JDK and plug-in version conflict. I compiled using 1.8 ... the latest one, and that message started to appear. So I've searched for the JRE 7 (http://www.oracle.com/technetwork/java/javase/downloads/server-jre7-downloads-1931105.html)... and installed it... again... Now 1.8 and 1.7 in the same computer. Using NetBeans, and compiling, and targeting to version 1.7, fixed my problem. 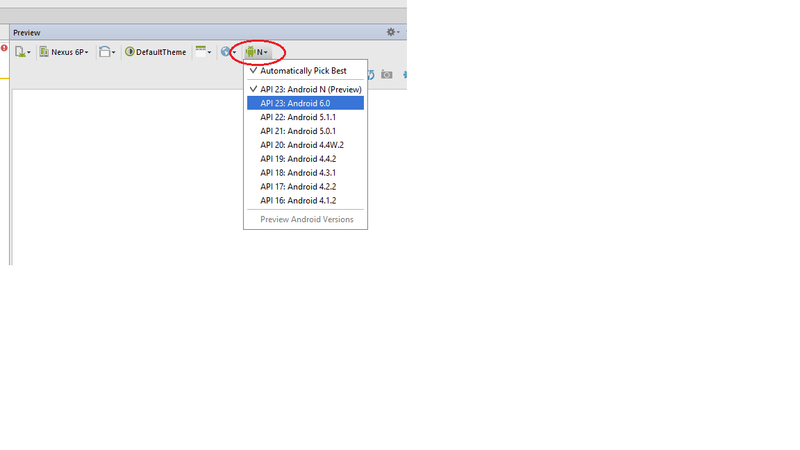 If you have a problem in Android Studio and you have installed Android N, change the Android rendering version with an older one and the problem will disappear. If you're using the NetBeans IDE, right click on the project and choose Properties and go to sources, and you can change the Source/Binary Format to a lower JDK version. Unsupported major.minor version 52.0 comes when you are trying to run a class compiled using Java 1.8 compiler into a lower JRE version e.g. JRE 1.7 or JRE 1.6. Simplest way to fix this error is install the latest Java release i.e. Java 8 and run your program. It happens when you compile your projects on higher version of java(say jdk 1.8) and then run it on a lower version (say jdk 1.7). 5.Click Apply and run your project. I could solve the same problem using the below solution. In my project, I added a JAR file which were created in Java 8. And my project was referring to JRE 7. When I changed project JRE to 8, my problem was solved. 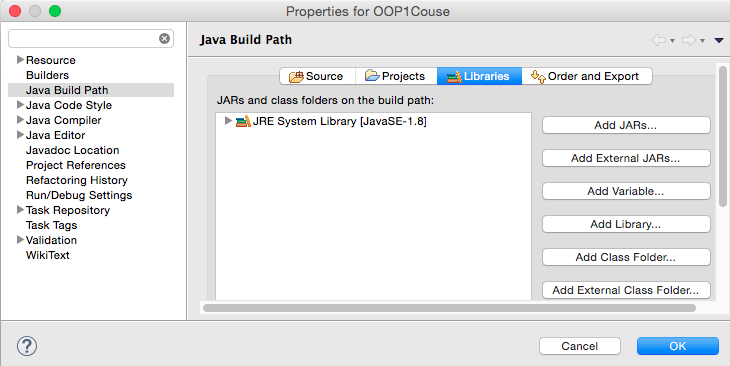 In Eclipse, right click on the project name in project explorer → Build path → Libraries → click on JRE version → click Edit → Installed JRE → Add → Standerd VM → select JRE home click-path (path should be localePath\java\jdk1.8.0_25\jre) → provide name → Save → select same JRE for project → Finish → OK. Refresh/build project once → try to run your Java file. It should work. I solved my problem by removing old versions of JRE and installing JRE 8. I had Java 1.7 & 1.8 installed (with SBT 2.4 that requires Java 1.8). Even though my project was linked to Java 1.8, I had to change the JAVA_HOME environment variable to point 1.8. Finally, problem solved. If you are using Eclipse, make sure your menu Project → Properties → Java build path → libraries → JRE system library matches your project requirements (as shown in the image). All you need to do to solve the problem is... to make sure your version of Java is the same for both compiling and running. No matter what tools or IDEs you are using. This will give a quick way of switching between the Java versions installed on the system. By choosing Java 8 I will solve your problem. This occurred to me when I installed a fresh Java 1.8, but left the old command line interpreter open. It had an old path and kept on executing the application with Java 1.7 whereas project was already built with Java 1.8. If your JDK version is right. Another reason that may cause this error is that your Android Studio is in a low version, but your Gradle version is too high. Upgrade your IDE to a newer version may help this. You need to use JDK 1.7.0 rather than JDK 1.8.0. To make sure it, you need to delete JDK 1.8.0 on your computer. Then, you need to reinstall JDK 1.7.0, and you will succeed to generate the .jar file. Upgrade your Andorra version to JDK 1.8. This is a version mismatch that your compiler is looking for Java version 8 and you have Java version 7. You can run an app build in version 7 in version 8, but you can't do vice versa because when it comes to higher levels, versions are embedded with more features, enhancements rather than previous versions. You may want to check your Run Configurations setting if you're using Eclipse v4.4 (Luna) and have already completed all steps mentioned above. There could be several possibilities that cause this error. The root cause is a mismatch of the project require compilation in JDK1.8/JRE8 while the environment compiler is JDK1.7/JRE7. You can check my blog post to go through all your settings are correct. I ran into this issue in Eclipse on Mac OS X v10.9 (Mavericks). I tried many answers on Stack Overflow ... finally, after a full day I *installed a fresh version of the Android SDK (and updated Eclipse, menu Project → Properties → Android to use the new path)*. I had to get SDK updates, but only pulling down those updates I thought were necessary, avoiding APIs I were not working with (like Wear and TV) .. and that did the trick. Apparently, it seems I had corrupted my SDK somewhere along the way. BTW .. I did see the error re-surface with one project in my workspace, but it seemed related to an import of appcompat-7, which I was not using. After rm-ing that project, so far haven't seen the issue resurface. None of these answers helped me, but I found a solution. I had a webproject used in Wildfly 8.2, built with Maven, source and target was set to 1.8 on maven-compiler-plugin, as well as all Eclipse and Maven settings were set to Java 1.8. The problem was that Wildfly 8.2 cannot handle Java 1.8, so I had to set everything to 1.7 and it worked. Just want to add this. I had this problem today. Adjusted the settings in my project, rebuilt, and same problem. I had (incorrectly) assumed that changing the settings in my project (Eclipse) would cause the projects on which my project depends to be recompiled also. Adjusting the settings to all of the projects up the dependency tree solved the problem. If you are using IntelliJ IDEA, go to Project Structure (Ctrl + Alt + Shift + S), and you can change your project's JDK. Not the answer you're looking for? Browse other questions tagged java applet version unsupported-class-version or ask your own question. Unsupported major.minor version 52.0 - while using a lower version to compile. How is it still going bad? 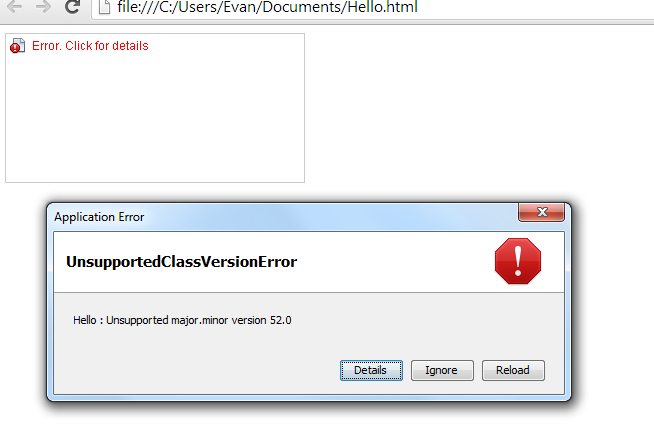 My java applets won't run in browser due to version mismatch although fully updated. How can this be? How does double buffering in applets work?